Hobby Lobby is your one stop shop for all your arts and crafts needs. The company was founded in 1972 and today has more than 490 stores in 40 states. Stop into a store near you and check out their huge inventory. Are you looking for art supplies? They have acrylic paints, watercolors, brushes, easels, and canvases. Do you need some party supplies for your child's birthday party? They have invitations, favors, gift wrap, pinatas, and cookie cutters. Are you searching for some great fabrics to redecorate your home? Their fabric department includes children's prints, home decor fabric, tassels and fringe, window shades, and drapery. If you're creating a handmade wreath for the holidays check out their floral department. They have a variety of silk flowers, greenery, and foliage. They also offer pre-made arrangements if you don't want to make your own. Don't forget to check out their hobby collection; it's what their known for. They have model planes, model paints, balsa wood, rocket kits, display cubes, and much more. Their other departments are home accents, jewelry, needle art, scrapbooking, seasonal, and wedding. Save on your purchases today with a discounted gift card from GiftCards.com. 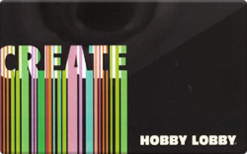 Gift cards are redeemable in Hobby Lobby store locations. Buy a discounted Hobby Lobby gift card to get a discount on everything in their store. The gift cards do not expire.